Why Buy A Leather Sewing Machine? Standard home sewing machines are not designed for stitching through tough leather materials. Needle holes on leather are irreparable. This will only result to damage and wastage. Obviously, you’d want your stitches to be faultless each time. Also, leather tends to stick to the presser foot of standard sewing machines. This can cause a stuck or broken needle. Feed dogs, too, can mar your projects. Who wants these things happening in the midst of a project? Not you definitely. To avoid all these hassles, you’ll need to invest in a leather sewing machine. This is a heavy-duty sewing machine specially made for thick materials like leather, vinyl, canvas, tarpaulins, and upholstery fabric. Ideally, it will feature longer stitches than the usual lengths which are more compatible with these types of projects. Brother PQ1500SL is a semi-industrial straight stitch sewing machine. It comes complete with a long platform and a removable knee lifter. 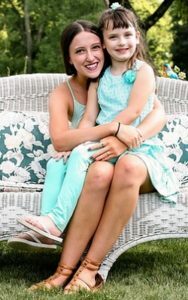 It is solidly constructed and weighs close to 30 pounds. If you’re serious about sewing, your arsenal must include PQ1500SL. The best thing about this machine is that it has the features of most high-end industrial models at a fifth of the price. You have to come to terms with one thing – it does straight stitch only. It’s a no-nonsense machine without fancy stitches, but it sews with incredible straightness and speed of 1500 stitches per minute. You can adjust the stitch up to a length of 7mm. To put this in perspective, standard home sewing machines will have stitches of 4-6mm. Industrial ones are capable of producing stitches with 8-10mm lengths. PQ1500SL should be on top of your list if you regularly sew special fabrics like suede, leather, and bulky quilts. It has a special pin which when engaged will protect velvets and leather from being marred by the feed dog. This is a feature unique to Brother. Feed dog settings can be adjusted to four heights, instead of the usual two settings. You can customize the perfect pressure for your sensitive projects by working this out in tandem with the presser foot pressure dial. Let’s give PQ1500SL another quick once-over. It has an automatic needle threader, a tension dial, and a fast bobbin winder. 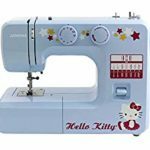 It also boasts of a 6-inch high throat, a thread cutter button, reverse stitching, a fabric separator, and a button for needle down position. The maximum presser foot height is ½-inch. The feed dogs can be dropped to allow free motion quilting. You’d also love that it comes with a 12”x18” extension table. Overall, this is a sewing machine that does not only have speed and power. It also features finer points which make adjusting settings easy and compatible for sensitive projects. Singer Stylist 7258 will see you through a variety of projects, including leather sewing projects. This computerized sewing machine provides superb features and comes packed with accessories. It has 100 built-in stitches including 7 fully-automatic 1-step buttonholes. What’s really special besides those attractive stitches is its ability to sew through thick fabric. It goes through 3 layers of denim, canvas, and medium-weight leather. You can program its needle to stop or start in the up or down position. This feature is important for many projects including quilting, crafting fashion accessories, embroidery, upholstery, and leather sewing. You’ll appreciate this function more than ever once you start using it. The top speed of 750 stitches per minute is easy to adjust using a speed control lever. You can customize the stitch’s length and width with a push of a button, and it automatically adjusts thread tension. You can view the settings on its large LCD screen. 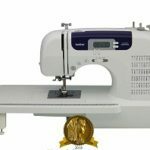 This heavy-duty sewing machine features an automatic needle threader, automatic bobbin winding, extra-high presser foot lift, reverse stitching, and automatic pressure control for the presser foot. Singer heavy-duty 4432 is easy to use even for beginners, and it’s packed with more than just the basics. It has less than a third of Singer 7258’s 100 stitch varieties. 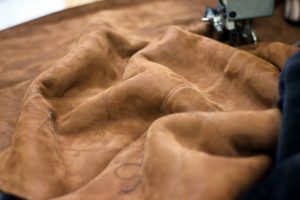 If you intend to sew leather, though, you won’t need fancy stitches. What this heavy-duty sewing machine lacks in number it compensates with awesome motor power. It is 60% stronger than standard home sewing machines, so it’s capable of cutting through tough materials. It has a heavy-duty metal frame and a stainless-steel bedplate. Owing to this heavy build, it weighs more than Singer 7258, yet still remains very portable. Its top speed of 1,100 stitches per minute shortens the time you spend on any project. Since it’s a mechanical machine, you won’t find the buttons and LCD display for computerized settings. What you have instead are knobs and dials for fine-tuning. 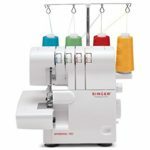 Its features include a 1-step buttonholer, a removable free arm, easy-snap presser feet, a top-drop bobbin, three needle positions, reverse stitching capability, and an automatic needle threader. It has a high presser foot clearance to make sewing leather and other thick fabrics so much easier. Using the appropriate needles, threads, and presser feet, you’d have no problem sewing leather bags, wallets, and patchwork with Singer HD4432. Others complain that it runs so fast. This is not a product flaw and shouldn’t be counted against it. We believe you will resolve this issue after getting used to the foot pedal speed controller. Singer HD4423 is slightly cheaper than HD4432. It packs the same motor power, top speed, and a strong build. It comes with the same features and even the accessories. They only differ in the number of built-in stitches. 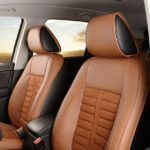 It sews through tough materials, like leather, canvas, and upholstery. Thickness though is another matter. You’d have to experiment with various thicknesses to find the optimum which HD4423 will stitch through without issues. It runs flawless stitches through six layers of vinyl upholstery fabric. That should give you an idea of how tough it is. If you don’t need the extra stitches offered by HD4432, then save a few dollars with this model. The rigid frame, strong motor, and easy-to-use features are its strong points. It runs fast, though, and the foot pedal is very sensitive. Beginners may find their fabric racing forward, and that can be scary. In time, however, you’ll get the hang of it and start churning amazing projects with this leather sewing machine. What we’ve featured are heavy-duty machines that fall either under residential or semi-industrial categories. The residential types are your all-around home sewing machines. You can do some leather projects with them in addition to your other usual home projects. The Singer models above have the same versatility and portability of their standard counterparts. The difference is that these models are so much harder. On the other hand, if you intend to make heavy projects on a regular basis, Brother’s PQ1500SL means serious business. It has the basic straight stitches and power of most industrial machines. The difference is in the price tag. And even with its weight, it also still offers some degree of portability. It strikes a balance between industrial and basic home machines. What’s more, it’s not at all intimidating to use. If you’re a homemaker and you don’t sew leather aprons or furniture slipcovers every single day, our tough all-around Singer sewing machines are exactly what you need. If you want a nearly industrial leather sewing machine without the hefty price tag, then you should be looking at Brother’s PQ1500SL.